Studies say that jumping rope increases the heart rate way that makes the body uses oxygen more efficiently which enhances the health of the heart, lungs and circulatory system. 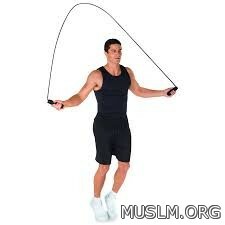 When jumping rope on the lungs get more air which helps solve a lot of respiratory problems. Doctors say that the jump rope from more exercises that cause the secretion of large amounts of sweat, which helps get rid of toxins stored in the body and thus help to regenerate the body's cells to operate at full capacity. This sport helps boost pump blood properly and more efficiently to all parts of the body especially the arteries, which reduces the risk of heart attack. Studies confirm that jumping rope for 30 minutes burns about 400 calories, and this includes the stored fat all over the body, so the doctors people who want to lose weight by following this exercise a day is recommended.